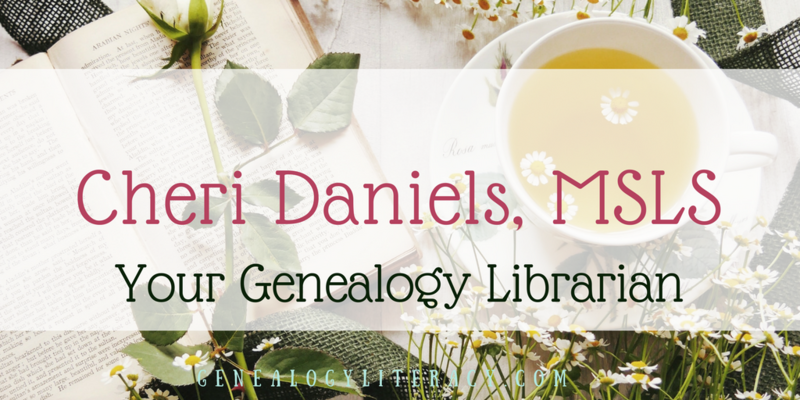 Everybody loves a great party, but a genealogy party….that’s an event to be reckoned with! We are a little less than a week away from genealogy’s biggest annual shindig. In my part of the country, shindigs are epic, and RootsTech does not disappoint. In fact, as we draw closer to the event, the energy builds, and we all feel like kids on Christmas Eve. 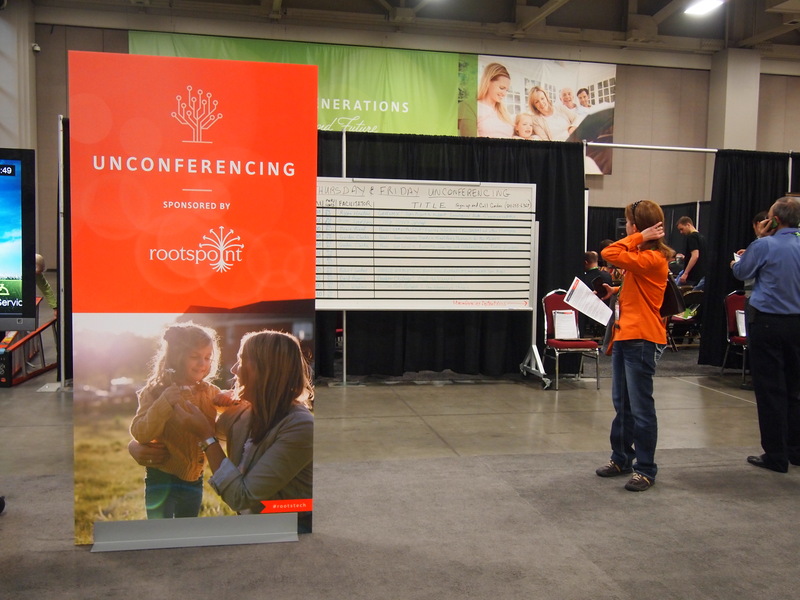 I have been to several RootsTech conferences in person, from the very first one, as both attendee and presenter, and I have always been surprised about the mixed reaction this conference receives. Folks either love it or they hate it – and I fall firmly in the “love it” camp. But perhaps, some of the grumbling comes from a different set of expectations? 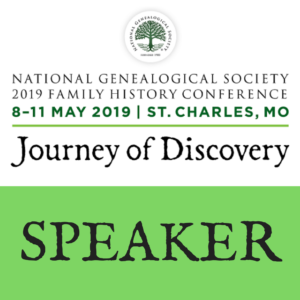 It is completely unlike the other national genealogy conferences out there. Simply because it’s supposed to be different. The more attendees understand its underlying purpose as a conference, I think the more they would say “vive la différence”! 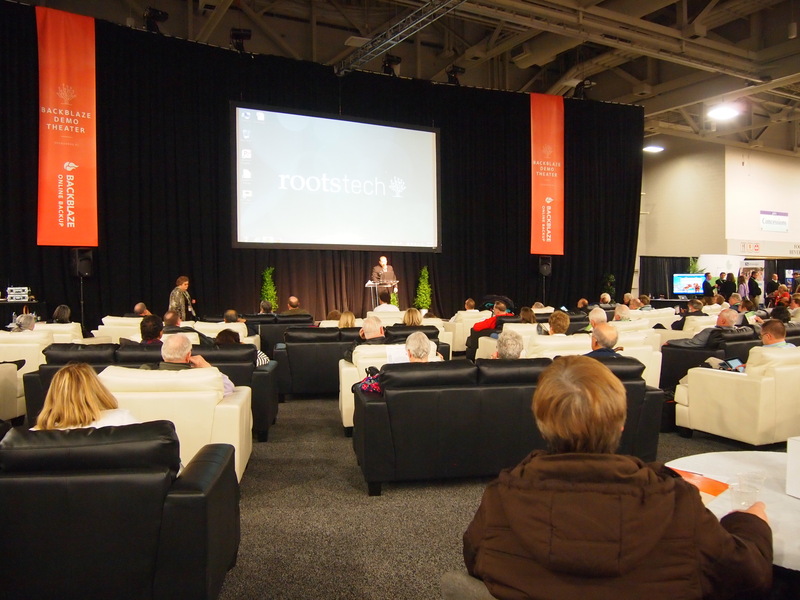 From the very first year, RootsTech had aspired to be the genealogy tech sandbox or playground – a place where programmers and users could get together to explore what worked in our industry and what didn’t. 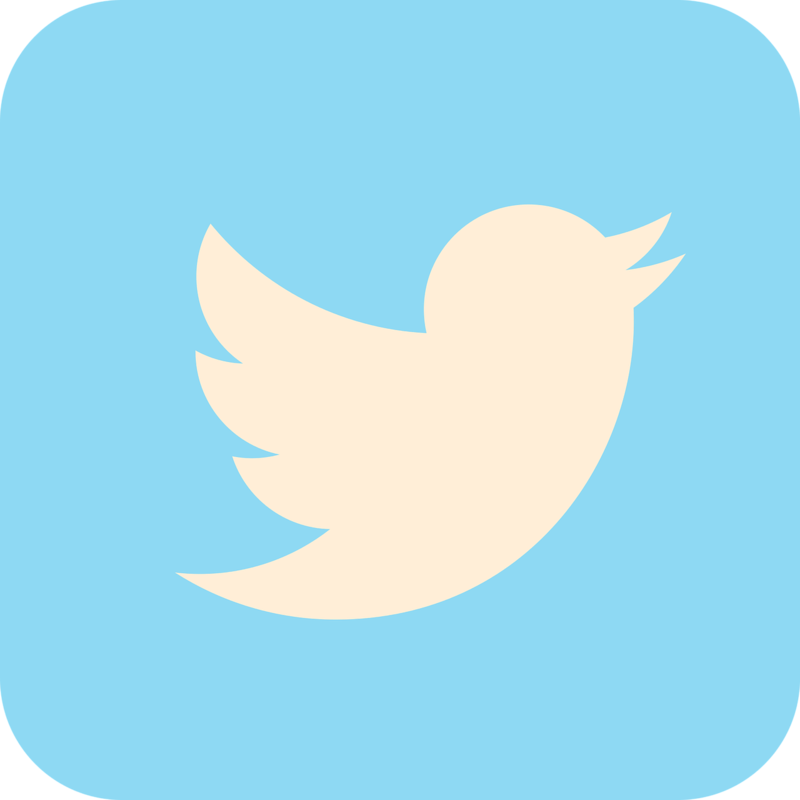 A place to introduce new tools and resources for our field, and where to engage with others. While this happened a lot at the very first conference, attendance necessity did not allow this concept to continue unaltered. My personal opinion: While this interaction with programmers and users still happens at RootsTech, it does not happen on the same level that it used to mainly because of the differing wavelengths of programmers and users. In many cases, we don’t speak the same language, and dialogue can get frustrating really quickly. As an alteration to the overall concept, RootsTech was great in shifting towards a storytelling/sharing, DNA, and digital resource focus. 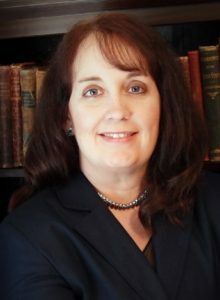 In essence, keeping with a tech foundation, while bringing in more sessions of traditional genealogy instruction to appease a wider audience. And it has grown exponentially over the years – which means, despite some growing pains and hiccups over the years, they must be doing something right. For those of you who attended last year’s severe hiccup with badge scanning – they have promised to do away with that process for this year – which should make attendance much smoother. 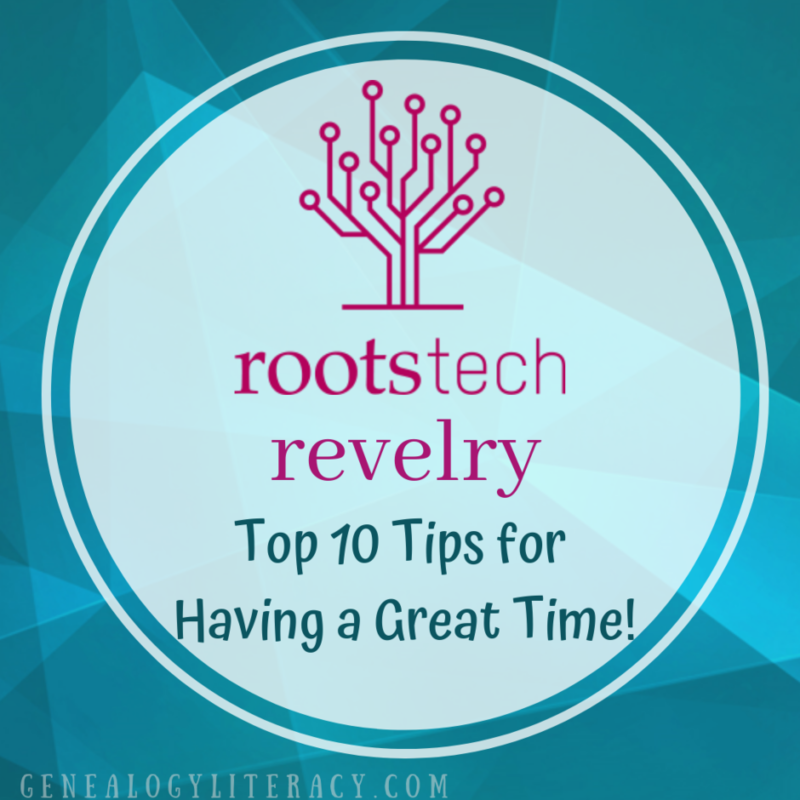 For those of you new to RootsTech, I am going to outline some of my favorite bits of advice to get the most of out this conference. 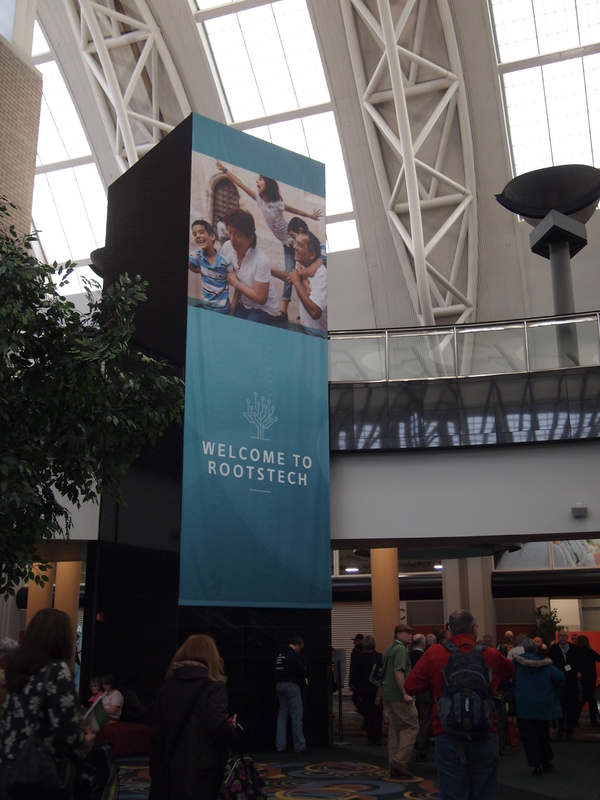 So buckle up, Buttercup – it’s time to dive into RootsTech 2019! 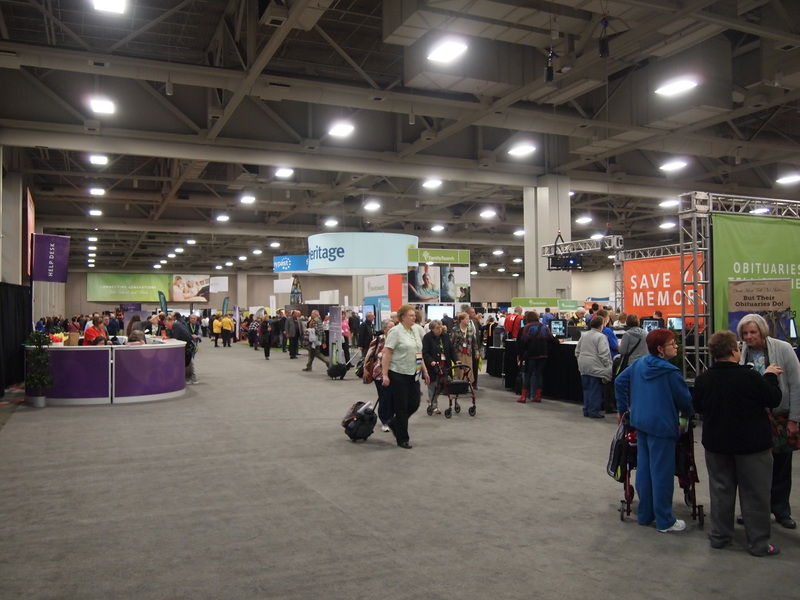 Adjust Your Expectations: This is NOT NGS or FGS – this is RootsTech. It will be a different experience overall, and many of the sessions will be different. Some would say, not different enough, which is a good point – but go in with your eyes wide open, and your expector antenna set to tech overload! In other words, go with the flow and have fun with the offerings – you will learn new things, and come away with renewed inspiration. 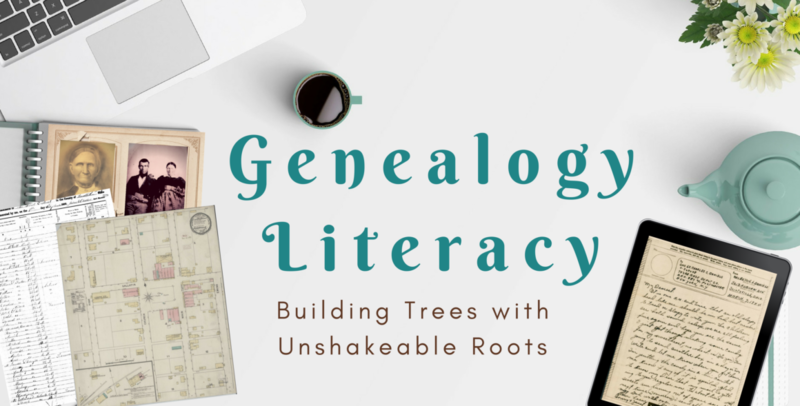 This is the pep rally of genealogy, and its message is family, connections, and inspiration. The energy alone is worth the trip. Use the App!! So much information in one little space – this is how you get to the syllabus material, schedule your session attendance, learn more about speakers/vendors, and keep updated on conference announcements. And don’t forget – they really want you to rate the sessions you attend through the app – it helps with next year’s planning, and determines whether your speaker receives any bonuses based on your rating. As a bonus, you can also make friends in the app, and learn about great places to eat. Introvert Alert: This is the largest genealogy conference on the continent – so it will be crowded – really crowded. Pace yourself, try to make some new friends, and go take a break if you need to – like, in the big comfy demo stage chairs, with some popcorn, and a soda. There are some places to break away and take a breather – and if necessary, sneak back to the hotel for a nap. So Many Sessions, So Little Time: You may not get to attend every session you have your heart set on – as I said above, it is crowded, and while they plan as best as they can for attendance numbers per room, some may hit capacity, and you may be forced to move to another session. This is where the app can be a lifesaver! As you review the session descriptions, and pick (star) your favs, be sure to pick a few per time slot. The app lets you pick more than one per hour for your personal schedule. It will warn you that you’ve picked more than one, but if you can pick your top three each hour, you will be able to attend the alternates at a moments notice, instead of scrolling through everything while the seats continue to fill up. Make the Exhibit Hall a Top Priority! This is by far the largest exhibit hall you will encounter in genealogy conference land – so many new companies and tools, tips on how to use your favorite tech tools, and demos all day long! It is so important to examine the exhibit hall map as closely as you do the session list. 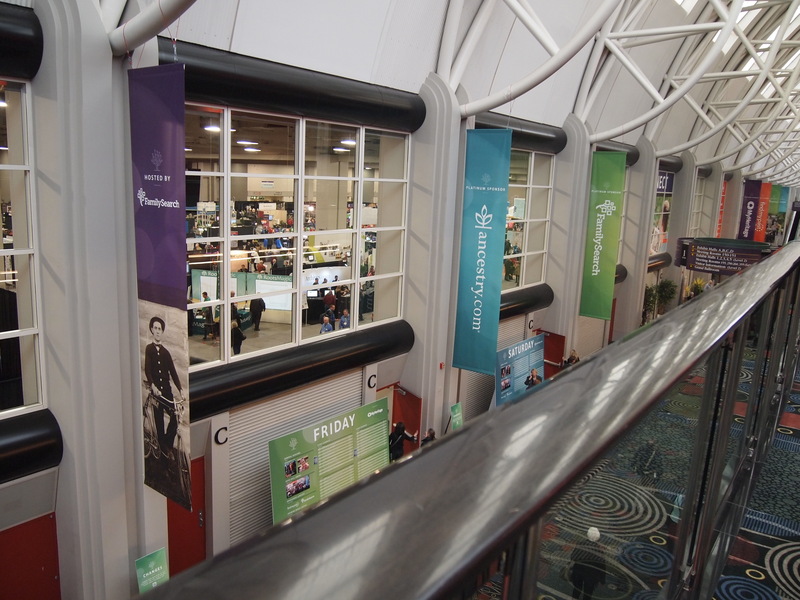 Besides, the hub of the RootsTech party is in the exhibit hall – with an energy that does not sleep. BTW, for those of you attending a virtual pass, or staying home to watch a few of the live streaming, the exhibit hall is always open to you virtually. Take the exhibitor list, and visit all of their websites to tour their products or offerings = another great way to be a part of the action! Don’t Forget the Unconferencing Sessions in the Exhibit Hall! 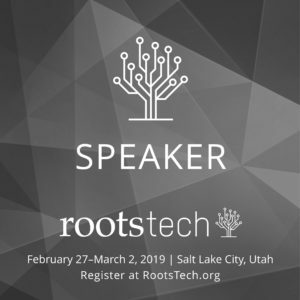 I have mentioned this aspect of RootsTech in the past, and some have given me a side eye, because they didn’t know what I was talking about – which is such a shame! From the very first year, these unconferencing sessions were implemented to encourage conversations – tech, genealogy, or both – programmers, genealogists, or hopefully both – all in rooms/booths they could schedule to talk about anything in the industry they wanted to cover. And this tradition has not wavered. 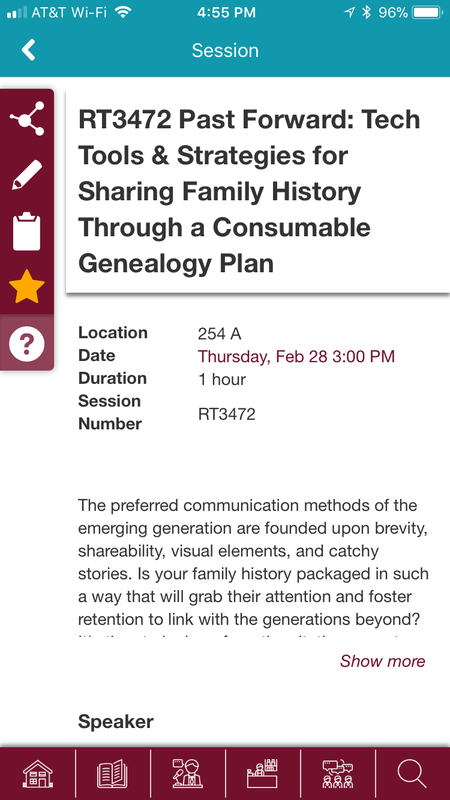 In fact, this is one of my favorite things to do at RootsTech. The unconferencing sessions are along the North side of the Expo Hall. I will be hosting a session as a follow-up to my class on Consumable Genealogy – giving a live demo on using Canva and Pixabay – and there will be a couple of chat sessions about Genealogy in Second Life, hosted by the Second Life Virtual Genealogical Society – so be sure to check in at the unconferencing boards to plan out your participation. Don’t Over Do It. You cannot experience everything there is to offer, and it’s important to understand your own limitations. So prioritize your time within reason – and if you get overwhelmed, head over to the library for some research – they are open until 9pm just about every evening – and you won’t want to miss the opportunity of researching in the nation’s most comprehensive genealogy library. The Common Sense Stuff: As with any conference, this is a marathon, not a sprint – you need to stay hydrated, get plenty of sleep, dress in layers, eat healthy, and wear your walking shoes. I noticed from the most recent ‘behind the scenes’ video – a tour of the Salt Palace – that the on-site check-in is on the opposite end of the building – back where the very first conference took place. In other words – seriously – wear comfortable shoes!!! Smile, have fun, be nice, and soak up the energy that will inspire long after we get home to digest all we have learned. That’s about it for now, folks – I’ll see you in a few days! 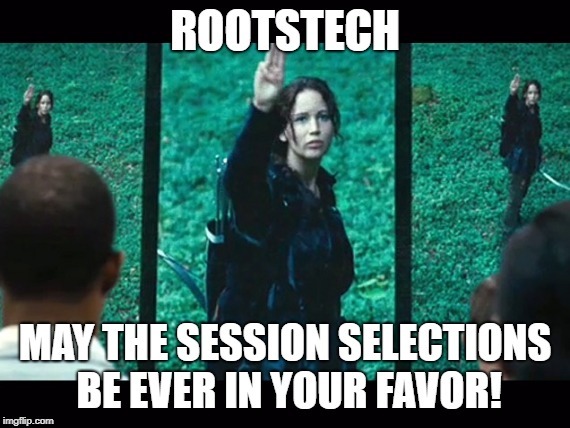 Safe travels and may the session selections be ever in your favor!! This past February marked a milestone of sorts: February 26th was my 10th Rezzday. For those of you unfamiliar with Virtual Worlds, a Rezzday marks the birth or “rezzing” of your avatar. For these past 10 years, my Virtual World of choice has been Second Life (SL). 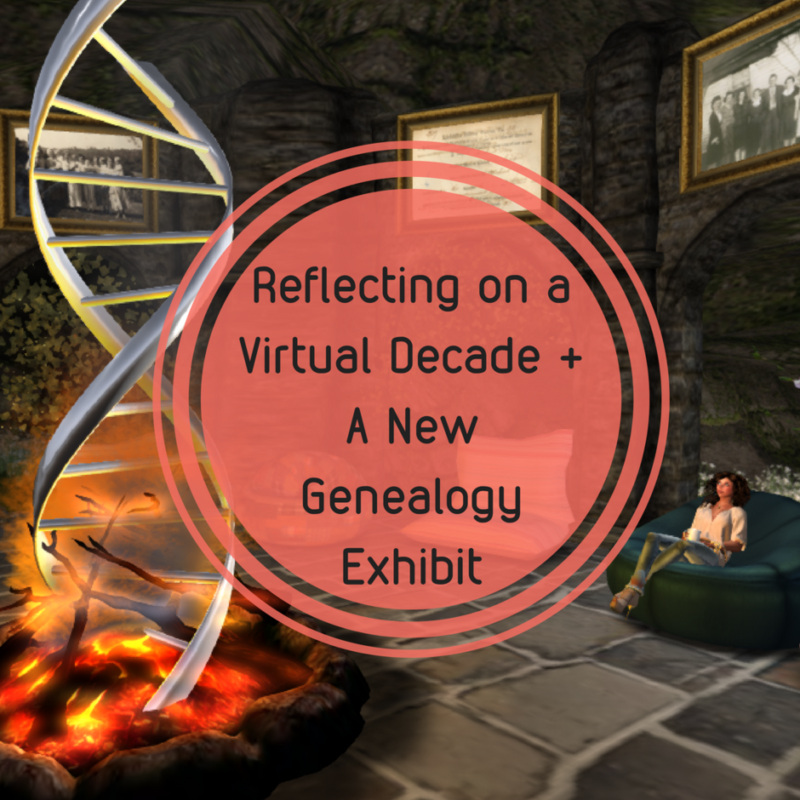 And, for those of you rolling your eyes right now – scroll down to my “Genealogy in Second Life” section – the opportunities for genealogy collaboration and learning are worth the read. I cannot begin to explain the depth of experiences and wealth of life changing relationships that developed over 10 years, but I feel it’s necessary to explore the impact of this level of technology. The avatar that was born 10 years ago was different, because I was different 10 years ago. She and I are forever linked in a technological dimension that taught my human a great deal. Right around the same time I rezzed an avatar for the first time, I was just finishing up grad school for my M.S. in Library Science. Ironically, my first steps into the virtual realm came on the heels of my cannonball jump into social media. They were a package deal in a sense, as they all developed through a program at work. A few UK librarians exploring the island just after the grand opening in 2008.
tools. Through this program, we learned how to blog (various platforms), use Facebook, MySpace, Twitter, Bitly, Linkedin, RSS Feed Readers, Link Aggregators, and for extra credit: Second Life. It was essentially a ‘play as you go’ structure – we were allowed about 2 weeks per tool for testing during work time. This allowed us the flexibility to learn how to use these tools while avoiding negative impact on our work duties. The balance was perfect, and I don’t think I’ve ever had so much fun at work – it gave us new energy, fostered collaboration, inspiration, and built new friendships among the staff – several friendships and collaborations emerged across campus. A lot can be said for allowing adults the opportunity to play in creative ways. I know it was the best investment they could have ever made, and it worked like a charm. Until they mentioned SL, I had never really heard anything about it – but upon their introduction, we learned that the University had already purchased an island and was developing the space for educational purposes. A replica of our library had already been built, complete with a reference desk for information and a meeting place for several groups, including other Kentucky librarians and educators from across the state. There were other departments on the island such as Fine Arts, Drug Endangered Children Network, Political Science, E-Learning, Admissions, Psychology, Medical, etc. It was a very nice sampling of educational projects, operating together on this virtual island. The 3D virtual representation of the William T. Young Library – at least on the outside – the inside was open for exhibits and meetings. The activities on this island built my skills in programming, exhibit design and construction, speaking, event planning, in-world design/construction, and collaboration. What an amazing sandbox of creativity and learning – pun intended for those who are familiar with SL terminology! Our harvest festival with a joint live performance of a Bluegrass band playing at the Fine Arts Library and streaming live into Second Life. And then I traveled OFF the island to discover: GENEALOGY and HISTORY and ART! I was not prepared for the amazing things I encountered! The educational, historical, and artistic realms were, and continue to be phenomenal! Not only can you tour historical recreations and unique 3D art installations, you can also learn from top professionals in a variety of fields! Toured art gallery openings and original art installations that can only be experienced in 3D worlds. Attended live theater and musical performances. Danced with Abraham Lincoln AND Henry VIII! Given instructional genealogy and library presentations (more on that in a second). Attended live performances of Shakespeare plays (while dressed as Queen Elizabeth I) held in a replica of the Globe Theatre. Participated in a group discussion with reference librarians from around the world. Toured ancient Egyptian and European Renaissance cities. Attended memorial services for both colleagues and celebrities – and fundraising events after national tragedies. Edited a virtual library magazine. Curated and constructed exhibits – about quilts, the horse racing industry, and now genealogy. Attended Church services, political rallies, book talks, poetry readings, writing workshops, and toured interstellar space stations. Formed friendships professional relationships that are on target to last a lifetime. Once upon a time, there was a SL library magazine for librarians. Genealogy in SL has been here almost from the very beginning – and BTW, SL is now 15 years old! Probably the earliest genealogy activities came from the parcel created by the LDS Church. They have a replica temple and various centers for activity – including a Family History Center. They were the first group I stumbled upon, and their group meetings continue today. With the recent move of the Community Virtual Library (yes, a real library for avatars, complete with books to read and loads of social/educational activities!) 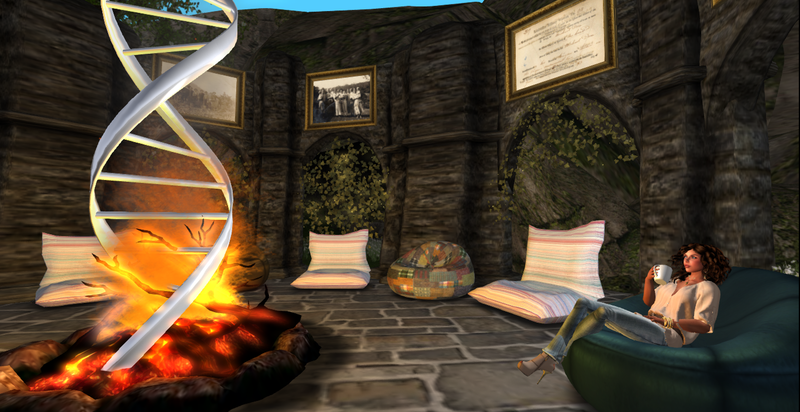 there is a new genealogy exhibit running there from July to September – put together by yours truly – located in the Secret Garden portion of the CVL parcel: Cookie Island. 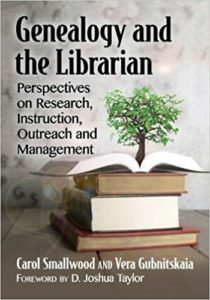 Libraries have been providing a wealth of information and educational resources since SL was born – and under the wonderful direction of Dr. Valerie Hill, that doesn’t appear to be changing! 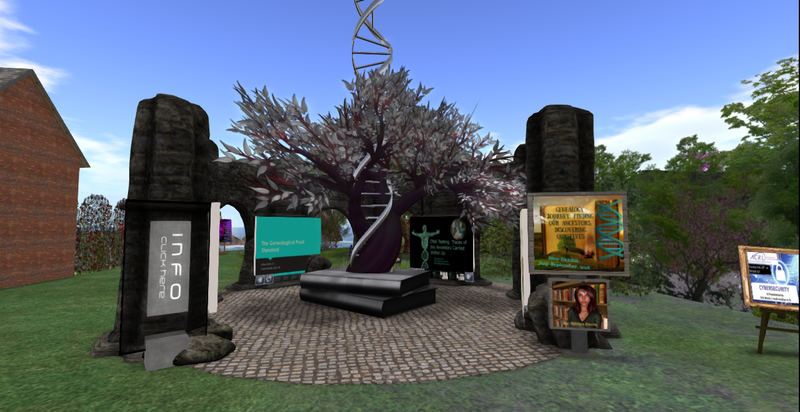 Just Genealogy: A place developed by genealogy’s own Dear Myrtle (Clarise Beaumont in SL) as a meeting space and social/educational haven for all things genealogy. You will find various groups meeting here for small group discussions, presentations, social gatherings, or just dancing. APG SL Chapter: A real APG chapter with officers, projects, and presentations. You have to be an APG member in Real Life (RL) to be an officer in this chapter, but the SL activities are open to everyone. They focus heavily on education through discussions and presentations. This chapter was the recipient of the APG Golden Chapter Award in 2012! Typical APG meeting at the Just Genealogy firepit. 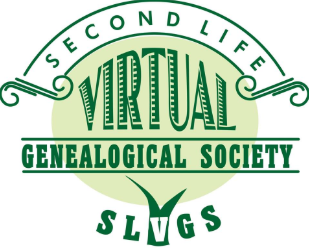 If you’re a big fan of online genealogy webinars and learning opportunities, you should seriously look into attending events in SL – and join the Genealogists in Second Life Facebook Group. You can create an account for free, which includes a ready-made avatar of your choice. If you’re not interested in the other layers of SL, such as clothes, shopping, and appearance, you are free to just treat this as another educational platform – entering for participation on your schedule. If you are truly new to this platform – do yourself a favor and watch a few tutorials to make getting around easier – or attend a newbie class. 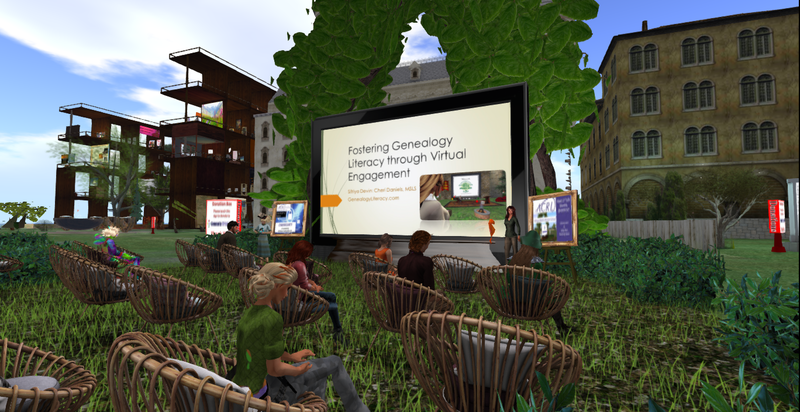 There are loads of these new classes out there – sometimes, even the genealogy groups hold “getting started in SL” events to ease the transition into a virtual world. Giving a presentation about Genealogy Literacy at the CVL earlier this year. Hosted by the Association of College and Research Libraries (ACRL). In 2018, some of the land parcels in SL are not as populated as they used to be, but the activities and inspiring places are still around in abundance (and experiencing a resurgence, IMO) – with the graphics and animations getting better with each year. Some things have changed drastically in SL – such as bodies and clothing – although, you’ll see my avatar running around as a more basic model – I’ve had no time to get into some of the more advanced appearance options. And I will not lie to you – there is a significant learning curve to SL – even sitting, walking, flying, and putting clothes on can be complicated processes to navigate in tandem. But once you get the hang of it, I’m convinced you’ll really enjoy the experience. In late fall 2017, the University of Kentucky Island was deleted/erased from the metaverse, which really was a full 10 years of use – they purchased the island in 2007, building the first structures and developing infrastructure to open fully in early spring 2008. Such a sad day, but, I know for certain that it was not a rejection of the technology that killed the island – but rather, a series of financial events that created a perfect storm. When the island was born, there was a significant educational discount which most universities took advantage of – but just as the recession was hitting, and budgets were cut, SL removed or drastically reduced this educational discount – effectively ensuring that some of the first cuts to go, nationwide, would be virtual classrooms/realms. Most did not survive this double whammy, and as the collegial network shrank, so did the activity. The only things that appear to continue with gusto, are international educational groups. 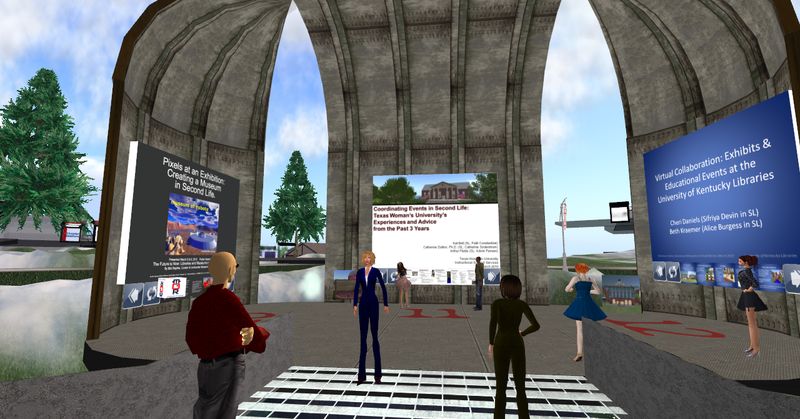 There are multiple professional conferences that take place in SL each year which draw hundreds of faculty members from around the globe. New virtual worlds have also been emerging – some with more control or requiring facial devices to make the experience more realistic. A new top runner is Kitely, an open source platform that is being frequented by educators. I predict someday, SL will be replaced by something easier to use, containing an even more realistic virtual reality – Linden Labs has already created a new Beta world called Sansar, and everyone is eager to see how SL residents take to it. But for now, most virtual world enthusiasts have invested a lot of time and money into making SL as expansive and dynamic as it is – It would be very hard to walk away from this world to build a new one from scratch. Time will tell – in 5 more years, SL will be 20 years old – quite amazing! 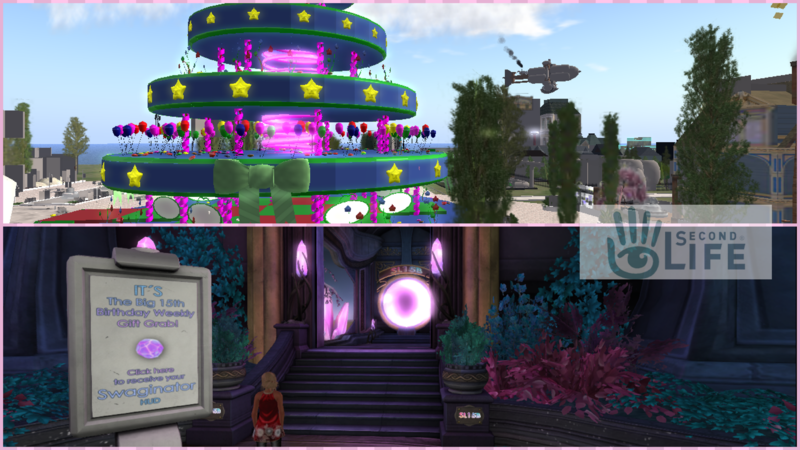 The difference a decade makes: Celebrating SL’s 5th birthday (top) versus its 15th birthday (bottom) – the graphics have advanced considerably. For those of you who have heard about the seedier side of SL – that is all true. Just like RL, this world is complex with varied experiences – all created by the users or “residents”. And just like RL, no one will force you to encounter or experience anything you don’t want to – you choose where to go and what to experience. I’ve spent a decade exploring, and rarely have I ran into anything by accident. Even your search interface and marketplace shopping can be limited to “General” rating – thereby excluding anything “Moderate” or “Adult” in nature. The Ancestor Grotto I created on my own parcel for ancestral storytelling. extension of your RL persona through emotions and relationships and learning. And yet, while I view her as an extension of me in the professional world, after 10 years, it is odd to see that she does not age as I do. 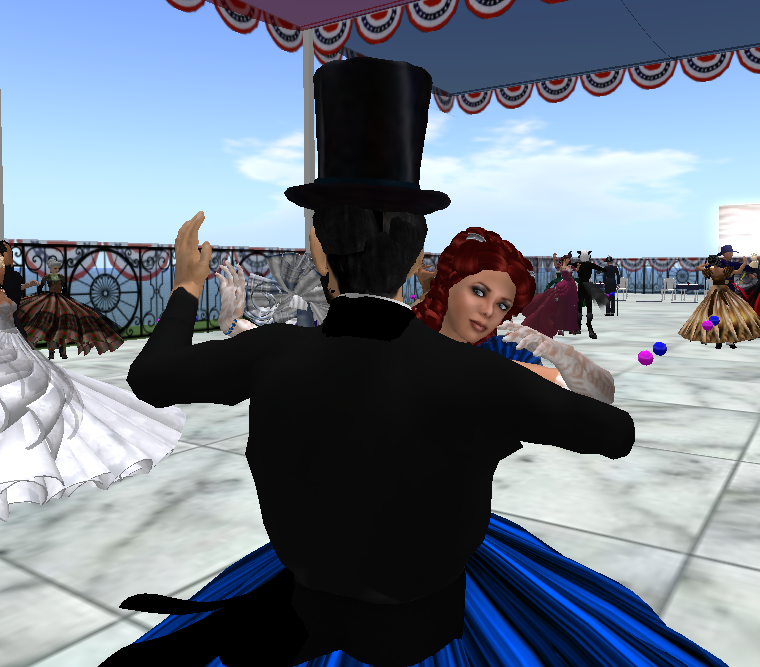 When I first created my avatar, I was in my mid-30s and much thinner, and she now reflects that previous appearance – her waistline did not expand as mine has over the years – nor is she forming wrinkles with time. In 20 years, will she still exist, as she does now, without aging, as I continue to grow older? I suspect she will as long as SL exists – but isn’t it ironic? As we age, we do not think of ourselves as older or old – we still view the world as a young person, despite how adulting may alter our attitude. As I said before, do not underestimate the value of creative play and learning – it keeps the noggin young – and as you get lost in the virtual realm of youth and limitless exploration, you can also advance your genealogy literacy skills!